With more windy days than you can shake your board at, it’s no wonder that Maui tops out at one of the best kitesurfing spots in the world. With 120 miles of coast and 30 miles of beach, of course Maui in Hawaii is on the must-visit list! With more kite-able days than you can shake your board at, it’s no wonder that Maui tops out at one of the best kitesurfing spots in the world. When you picture Hawaii surf, you will undoubtedly envisage big heavy rollers and tanned dons who learned to surf before they could walk. But here, there is reassuringly something for everyone. Whether you’re a beginner, freestyler, free-rider or towel minder, you won’t be bored on or off the board. Timing is everything! When to go? May to September is kitesurf season here in Maui. This is when the sun is out and the waves are just… perfect. Beginners and experts tackle the warm playground side by side, or more commonly, on either side of the reef! The north easterly/easterly winds are pretty strong and steady year round, but not over powering so don’t worry about being tumbled (too much). In winter, you’ll be pleased to hear that the waters are still warm (yippeeee), so boardies should be fine for every ride although winds pick up a bit more and actually can get a little… tumbly! It throws through some southerly Kona winds from time to time too, making the waves a bit more suited to those who really know what they’re doing. Either way, summer or winter, Maui is a pretty good spot. Just don’t forget that you are on a tropical island surrounded by 2 volcanoes… warm rain is likely to be part of the package. Before you hit the waters of Maui, you need to know some basic rules of the land. 1. Kitesurf Curfew - Lye-ins are encouraged here as many places don't allow kitesurfers out until 11am … unless you're a beginner. And then you'll have to be an early riser for those kitesurfing lessons. Most areas follow this rule in Maui and this is placed at the number one because if you get this wrong, you'll become very unpopular, very quickly. 2. Yolo Solo - If you plan to venture out on your own, lifeguards are present 8:00 AM to 4:00 PM, ish. Beginners can be sure that they're safety is a priority at all times – you are being watched. In a totally good way. 4. Look Down – Basically, anyone in your way, has right of way. All kitesurfers will need to avoid swimmers, activity goers, windsurfers, surfers, divers, fishermen (the list goes on). In fact, you’ll have to keep 200ft (60 metres) from them at all times. Unfortunately, jumping over them is not allowed either. There always seems to be a "Kite Beach" in the best kitesurf spots around the world, so it won't surprise you that Maui has a Kite Beach too. Well, Kanaha Beach, technically. It is the main hub spot here for kitesurfers! 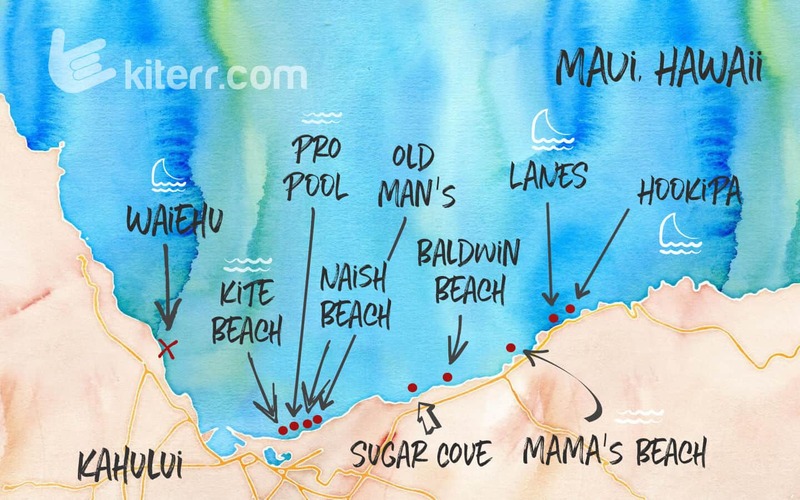 But there are also a few other spots to know about, so read on, here is your list of the best kitesurfing spots in Maui! Yup, we all know Kite Beach, with Teach Beach attached to one end! In the North of the island, all abilities flock to this spot. It has a pretty straight forward launch, a downwind landing zone (beginners can relax a bit if unable to stay upwind) and it is minutes from the airport, making it a zero drama, zero fuss, kitesurf starting point. On arrival, head straight to the west side of Kanaha Beach Park, a huge dirt car park that is consistently filled up by gnarly dudes in jeeps and campervans. Beginners can stick to teach beach, where the teaching happens (amazingly). Freestylers and beginners can enjoy the flat waters in the upwind pro pool, the small shorebreak and (when feeling a little more excitable) the choppier waves just inside the outside... that will make sense once you’re there! Once out-out, things start to heat up. Seriously, heat up. Expert wave riders should venture out to the outer reef to get some thrill, but be sure to check the swell report before you go… the waves can get big in winter and turn into double diamond blacks with no more than two minutes between. Wowza! The general rule is simple… the further out you go, the crazier you are. There are kitesurfing schools and expert guides all over the shore… it is worth buying them a beer and having a chat about riding zones and rules before heading out! Maybe the most renowned kite spot in the world, Ka’a Point is an international and local’s hot spot for those who know that they are doing. Upwind of Kite Beach, there is a protective cove that allows you to get close to the beach for that all important air shot photograph, that many get paid to line up for. But it is for you to know that this is a family beach first and foremost. Basically, this is a little territory game of ‘who is in the pool first’. If anyone (and we mean anyone) is in the pool, then unfortunately this is out of reach for kitesurfers. However, if it is empty then it is a little gift from Maui to you. Expert riders launch one-by-one near the shallow coral reef (Boneyards), maneuver the updraft from the trees and the heavy winds and once in, enjoy the rotation zone alongside the pros, pulling their big air tricks and finally landing further downwind, quickly! An open launch makes Flash Beach a fab alternative to Kite Beach. The long sandy stretch gives you a tonne of space to get set up, and the shore break offers plenty of entertainment near the beach. Things to avoid are the swim zones, the outer reef during low tide and the Rick Jetties (mostly downwind), so stay upwind from here, but not so high that you cross into the windsurfing zone. 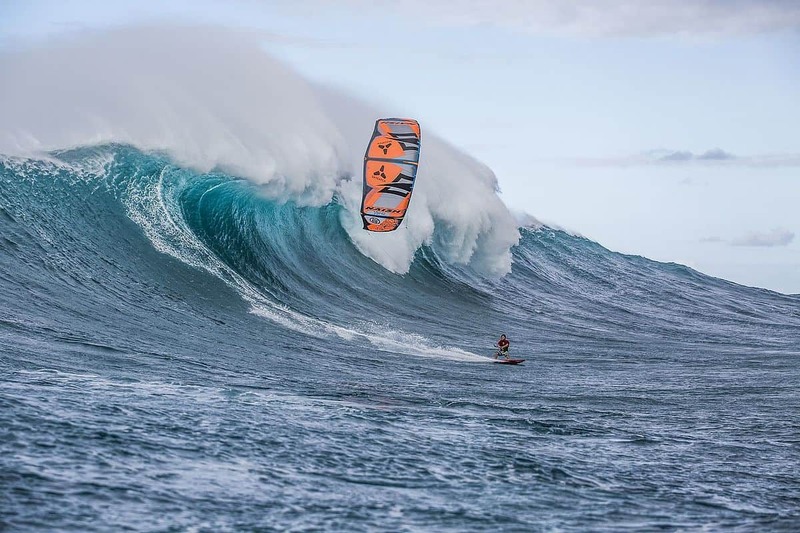 This may get a bit tangly if you’re not used to windsurf detours (see Rule Number 4 above)! Head to Old Man's Beach (Kanaha) parking lot for access. This is an awesome spot, but really only good with north-east winds. Sugar Cove tends to be a pain when the wind turns east as it gets nearly impossible to launch. No good for beginners. Nice long stretch of beach equipped with a lifeguard box, dunnies, showers and even BBQ's. Sweet! In the winter season, this spots gets a fantastic shorebreak, so it's the top spot the the local boogie-boarding legends. There is a sign marking the kiteboarding zone so make sure you stay out of the no fly zone. Strictly NO launching here, so this should be your end stop or landing spot if you need to self-rescue after the Lanes kitemare. Watch out for the sharp reef when getting out and grab a lunch at Mama's. Originally a windsurf spot, pro-kiters are taking on Ho’okipa on the northern part of Maui as spectators and riders alike. The run basically takes you from a tricky launch on a rocky coastline "Lanes" all the way over big waves when the winds are right. Downwind you hit H’poko which has some fairly strict rules of the waves, onto Middles Break (surfer territory) and down to Pavillions. All down this coastline, pro's hang out for some challenging stuff, avoiding sharp reef, rips and currents, and really strong winds. Big wave extremism, basically. Wear booties or you'll regret it if you step on a sea urchin or rough reef! Spot with a bit of swell and medium sized waves. Kiting here is good when the wind blows east, but this kitespot is not suitable for the beginners. If the wind is good 'n' stable and you're feeling up for it, take a downwinder from the kite beach to Waiehu as the locals do. No wind? Well, where to start! Maui is absolutely filled to the brim with alternative things to do on a down day. Even though "no wind" hardly ever happens, we would still suggest taking a day to explore this incredible destination. One thing you should know is that there are two great big volcanoes – Haleakala in the east is the largest of the two. You can hike, bike, or helicopter up it, and ride or slide back down. It is set within 30,000 acres of awe-inspiring national park, and if you can make it for the sunrise then that is pretty darn special - just try not to get lost otherwise you'll miss an epic day kitesurfing! Mauna Kahalawa is like its little volcanic sister, and takes up the remaining 25% of the Maui land in the west. Either way, rent a vehicle! Even though Kite Beach is super close to Kahului Airport – you'll want some wheels to lug your gear around and explore the island!